Big Bend National Park, TX - Near Rio Grande Village RV Campground - A peccary (also Javelina or Skunk Pig) is a medium-sized pig-like hoofed mammal of the family Tayassuidae (New World pigs). They are found throughout Central and South America and in the southwestern area of North America. 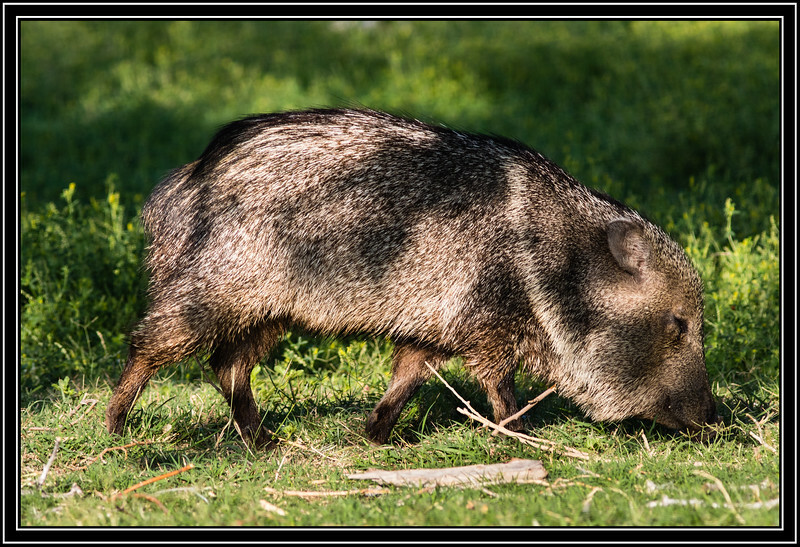 Peccaries usually measure between 90 and 130 cm (3.0 and 4.3 ft) in length, and a full-grown adult usually weighs about 20 to 40 kg (44 to 88 lb). Peccaries, native to the Americas, are often confused with the pig family that originated in Afro-Eurasia, since some domestic pigs brought by European settlers have escaped over the years and their descendants are now feral "razorback" hogs in many parts of the US. – A Javelina (My Pig) will have to substitute subject for the Chinese New Year of the Pig, starting from Feb. 5, 2019 and lasting to Jan. 24, 2020. The Pig is the twelfth in the 12-year cycle of Chinese zodiac sign. Texas, California? you are all over the place. hope you are enjoying it. Interesting looking member of the pig family ! Wonderful portrait showing its particular body characteristics !! Yep - I'm so glad I was born in the year of the Horse - rather than the pig. These guys are so destructive. Nevertheless, this is a great shot. Glad you remembered the occasion. Javelina - close enough!